The notion of having an outdoor kitchen is appealing for a lot reasons. First off, families spend a good deal of time in their indoor kitchens, either cooking, eating, drinking or just hanging out. It’s a social setting as well as a work one, and most people won’t struggle to come up with a nostalgic feeling or fond memory that took place in a kitchen. 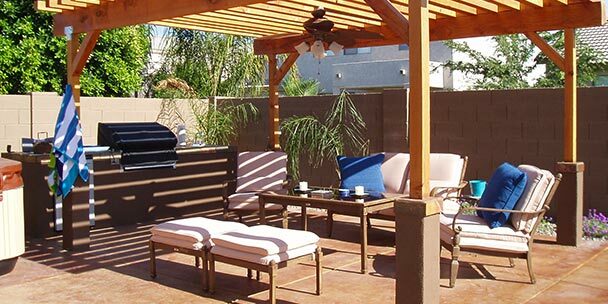 Extending that context to a backyard or patio only seems to make sense. Kitchens are also generally loaded with appliances and devices, which can make the area crowded and uncomfortable. In fact, nearly everyone will probably be able to follow up a fond memory in a kitchen with one of clutter and stress. Sometimes there just isn’t enough space for an oven, microwave, toaster, blender, crockpot, ice maker, rice cooker, kitchen mixer… oh, and maybe that new margarita machine you’ve been looking at. An outdoor kitchen extends the cooking area to an even more open environment, one that can feature that outdoor mini-beverage refrigerator you’ve always wanted as well as fresh air and a warm splashing of sunlight. Whether you throw shindigs every weekend or you just want a new area to cook, eat, and hangout in, an outdoor kitchen is a great investment and project wrapped into one. And at the very least it can drastically increase the value of your home, and there’s simply nothing wrong with that. How much patio space do you have? Are you looking for a propane or natural gas grill? How much work and storage space do you want to have? What temperatures will you be grilling in? Will you need space heaters or extra lighting? Exactly how big do the mosquitoes get where you live? These are all important questions, and they involve several pros and cons and various other factors you’ll need to consider before you go on a buying and installing spree. Take a moment to look at some of the more popular ideas and products that will hopefully arm you with enough information to comfortably set up your perfect outdoor kitchen. Your grill is like the heart of your kitchen. It is undisputedly the most important and central element of your outdoor kitchen. While charcoal grills are classic and fun to cook on, they’re hardly worthy of being the crown jewel of your new outdoor cooking facility. Not that a typical outdoor kitchen can’t include one. They can. Still, a built-in outdoor grill, either natural gas or propane, should be the central element to your new outdoor cook space. To properly install one, you’ll obviously need an island countertop. It’s preferable that the island you pick or build has ample space for your grill and whatever other appliances you might want to add to your open-air kitchen. For instance, a spacious countertop lends itself to easy prep work; a countertop island with a lot of depth can more easily accommodate storage drawers. It’s unavoidable that when picking your grill you’ll need to make the choice to go propane or natural gas. Each have their advantages and disadvantages, and while propane is the more popular choice, there are a lot of reasons people decide to go with natural gas. Perhaps the most popular defense of propane is its power. Propane contains roughly 2,500 BTUs (British thermal units) for every 1,000 BTUs of natural gas, approximately. From an efficiency standpoint alone, this is a big selling factor. Keep in mind that you have to purchase and keep a supply of propane tanks to fuel your grill. Still, the power allows you enough energy to grill for even the largest parties. Propane tanks will generally have a gauge as well to help keep you in the loop as to how much fuel you have left. It is beneficial as well to keep a couple of back up tanks on hand. Also, since you have to have a connection to a gas main to use a natural gas grill, propane works great for those backyards that don’t have easy access to a gas line. The Cal Flame G-Series built-in grill is an especially reliable liquid propane unit. It boasts 800 square inches of cooking space and can pump out 60,000 BTUs of cooking power. Made of 430 stainless steel, this model is both slick looking and durable. As stated above, you will need to have your grill hooked up to a gas main if you choose to go with natural gas. This means that you’ve got to be near a gas line or be willing to pay for an extension to reach from your yard to a gas line. But once this is done, you only need to worry about paying your gas bill. This means you’ll never have to worry about running out of gas and needing to go buy some more tanks. In addition to the convenience, natural gas is also a bit greener than propane. While neither fuel will contribute too much to your carbon footprint, natural gas does burn even cleaner than propane. 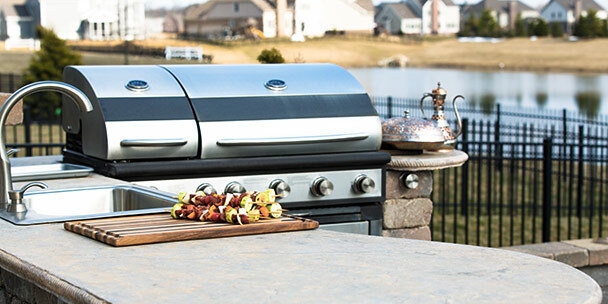 This built-in 4-burner natural gas grill from Blaze offers a lifetime parts & labor warranty as well as four 14,000 BTU main burners and a 10,000 infrared rear rotisserie burner adding up to a possible combined output of 66,000 BTUs. Flame stabilizing grids, a drip tray, and heat-zone separators are just a few of the classy features this model sports. It even comes in a propane variety if natural gas isn’t your fuel of choice. Sedona by Lynx also makes a built-in grill that can function as a propane or natural gas model. This powerful grill has four different burners: two stainless steel tube burners (23,000-BTU each), a Trademarked ProSear burner (23,000-BTUs), and an independent rotisserie burner (14,000 BTUs). A halogen grill surface light and blue LED illumination on the knob controls give this grill a gorgeous, professional look. Once you’ve made the choice between natural gas and propane, the real fun begins: extras! There are so many accessories available today for your outdoor grill. From side burners, to grill covers, to built-in storage and work space. This is where the real customization of your grill comes into play. Before you decide on anything extravagant like built-in refrigerators and extra stovetops, some built-in storage might be a good idea. There are a lot of different drawer and door combos for your countertop island that can really come in handy. When you think about all of the various trays and cooking utensils one uses when cooking or grilling, it just makes sense have some storage space nearby. Cal Flame in particular has a good variety of storage doors in all sorts of sizes and variations. From vertical, to horizontal, to double door access, their built-in doors feature industrial-strength hinges and are made out of 430 stainless steel. These are reliable, reversible doors that go well with almost any countertop grill island. Some options out there, like this door drawer combo from Blaze, offer a sleek, durable exterior and extra storage space. Made of 304 stainless steel, this combo piece comes with 2 drawers with smooth sliding mechanisms and a single, double-lined access door. Blaze also offers a vertical triple access door that has three sliding drawers stacked on top of one another, also made from durable, 304 stainless steel. Or checkout these double storage drawers from Sedona by Lynx which come with pro-style rails and matching stainless steel handles to give off a professional look while at the same time offering superb functionality. Some grills will come with a side burner attached. If however, the grill of your dreams doesn’t come with one, there are a lot options for a peripheral side grill. These are great for people who host big parties or events and are grilling a lot of different types of meats. Or maybe you’ve got a friend or family member who is vegetarian and wants some veggies grilled on a surface untainted by meat. Regardless of the reason, they’re a great addition. Cal Flame offers a built-in side propane side burner that comes with a natural gas conversion kit, so it’s especially versatile. It has burner lip guards to help prevent clogging and two burners adding up to a combined 30,000 BTUs of cooking power. In addition, its assembly and installation is quick and easy. A side griddle is another great addition to a built-in outdoor grill because it offers a whole different approach to cooking. These appliances are great for pancakes, grilled sandwiches, seafood dishes, and more. Griddles open up a whole new world for making and serving dishes to your new, open-air cook space. The built-in Hibachi Grill from Cal Flame is a fantastic side griddle that is compact and powerful. Fueled with propane, its two concealed burners can each put out 15,000-BTUs and the cooking surface is especially great for high heat retention. It even comes with a standard conversion kit if you want to switch to natural gas. These work best when placed directly next to the grill. It might even help to have two, one flanking each side of the grill. This was you can use one for meats and the other for bread, veggies, et cetera. Of course everyone knows that a real party doesn’t start till the sun goes down. The lack of light doesn’t have to be a problem for an outdoor kitchen though. These days there is a huge variety of portable lighting options to illuminate your outdoor cooking spot. Hanging yellow lights are easy to use and not overly bright. Outside torches are also popular, especially in the warmer months with various bugs and mosquitoes, as the smoke helps keep them away. There is no reason to stop grilling or cooking in your outdoor kitchen during the colder months. Well, the chill may be a reason, but it’s easily mitigated. A powerful patio heater or two can easily warmup a small area of your patio. They come in a variety of different designs and fuel types. Some are tower-like structures that run anywhere from 7 to 8 feet tall, and frequently run off natural gas. Some are electrical, offering thousands of watts heating power. These heaters, meant to be hung or wall mounted, are slim and unassuming while still offering a lot of warmth for nearby guests. These heaters work great for smaller, more intimate outside grill sessions. Another way to warm up during colder outdoor grilling festivities is a fire pit. These come in a variety of different sizes and designs, and are easy to set up. They’re a great source of heat and illumination for any crisp, chill autumn cookout. In addition, they work as accent pieces for your outdoor kitchen, and can function as a conversation locale for family and guests. If the grill is the heart of your open-air kitchen, then the outdoor refrigerator is some other equally important organ. After all, can you imagine a kitchen without a refrigerator, outdoor or otherwise? While trying to install a full-size, apartment fridge is probably not the best choice for an outdoor kitchen, there are a ton of smaller fridge units specifically suited for a patio or grilling island. The great thing about your typical outdoor refrigerator is that most are front-ventilated, which means they can function as built-in or freestanding. Having a built-in fridge in your grill island is convenient for a number of reasons. It doubles as storage and refrigeration. And think about all of the grilling ingredients and condiments you can store in a 5.5 cubic foot fridge. It’s actually not uncommon to see outdoor cooking setups with a fridge built-in to the island countertop area and an additional freestanding unit specifically for guests’ beer, liquor, and soda. Summit makes an outdoor refrigerator that offers 4.6 cubic feet of space and comes in a sleek stainless steel exterior. This fridge was specifically designed to brave the elements. It comes with three adjustable glass shelves, a keyed door lock, a digital thermostat, and an automatic defrost feature. Also offered by Summit is a double drawer outdoor model that features two adjustable shelves with two dividers in each drawer. Also built to withstand the elements, this double drawered unit comes with a Sabbath mode which disables the lights and alarms for up to 96 hours. If you don’t drink a lot of beer and soda, there are other refrigeration units that might still pique your interest. An outdoor beverage fridge can be an unexpected choice for your new outdoor kitchen. Typical outdoor refrigeration units aren’t ideal for any beverage that is supposed to be stored in a specific temperature range, like wine. A typical beverage refrigerator is much easier to regulate, temperature-wise. This is partly due to the fact that some of them are dual-zoned, offering independent cooling areas. Many operate as freestanding or built-in, giving you options as to where you want to install the unit. And despite the occasional clear glass door, a lot of beverage refrigerators still protect your collection from the sun by featuring double-paned, tempered glass. 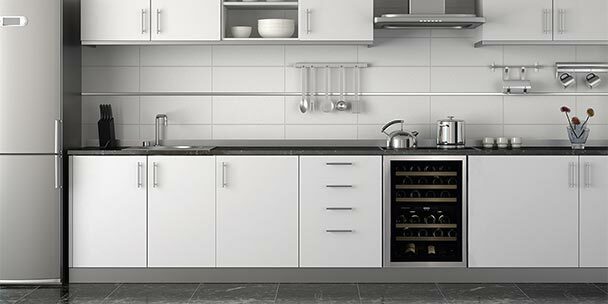 As an example, check out the dual zone wine and beverage unit from Summit. It allows for 5.1 cubic feet of storage and contains two different cooling zones. One zone has three wire shelves and the other has six shelves, and is specifically meant to hold wine bottles. EdgeStar offers a single zone unit that has a slightly larger capacity (5.49 cu ft) that can fit as much as 142 standard 12 oz beer or soda cans. Its interior is fan cooled and circulated in such a way as to not allow uneven cooling throughout the unit. Encased in stainless steel, this model also has no trouble braving inclement weather. Also offered from EdgeStar is the 84-can beverage fridge that sports a clear, triple-paned glass door. This helps keep the temperature in the unit constant, despite however warm the weather gets outside. An LCD display screen, controlled by soft-touch buttons, shows you the internal temperature. It’s hard to imagine a party or get-together where you don’t want to have a steady supply of ice. Having an outdoor ice maker means you won’t have to worry about constantly sending people out to the store to grab bags of ice. 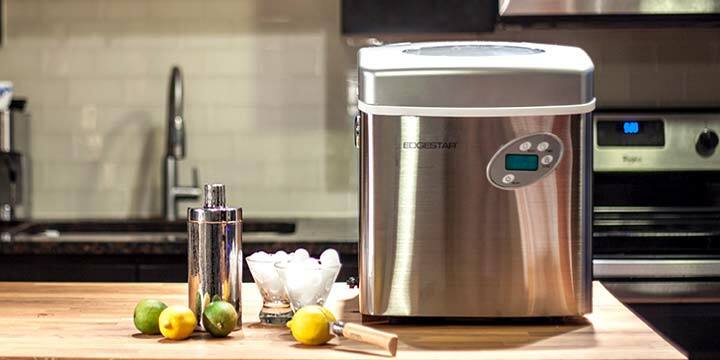 Whether you’re making frozen drinks, smoothies, or just standard cocktails for you and a couple of friends, having an ice maker specifically designed for outdoor use is a necessary luxury. Much like a lot of the aforementioned appliances, you can find kegerators that are meant to be freestanding, built-in to a counter, or function either way. Some may even come with casters for convenience and mobility. Regardless of what type of kegerator you pick for your outdoor kitchen, the one thing you can count on is it will be a hit. Stock you and your friends’ favorite brews, and enjoy draft pours from home with one of the many varieties of outdoor kegerators. Some even have two or three taps, so you can enjoy more than one type of beer. Having a kegerator with some good beers on tap also means that you’ll have more room in your outdoor fridge for soda and snacks. EdgeStar actually has outdoor kegerators that come in single, double, and triple tap models. These kegerators are powerful, air-cooled beer towers that feature front-ventilation and stainless steel exteriors. LED interior lighting washes your keg and its components in a soft blue light and an electronic display panel shows the temperature of your keg(s), and allows you to change it with touch-button controls. One of the most appealing pros towards adding an outdoor kitchen to the back patio or yard is also one of the most overlooked. It’s easy to forget just how much a snazzy, new open-air kitchen can potentially add to the value of your home. Of course the added value only comes with a well built and aesthetically pleasing home kitchen. As with any sort of home improvement project, it is possible to actually take away value from your property if you cut corners and look for hasty shortcuts. This is why research and budgeting is such an important step in acquiring a dream outdoor kitchen. But with some foresight, planning, and good old-fashioned decision making, your backyard kitchen fantasy came quickly become a reality. Grab a pad and pen, call in favors from all of your handy DIYer friends, and start planning out a building schedule and budget; the outdoor kitchen is a growing in popularity and becoming more feasible and affordable every day. 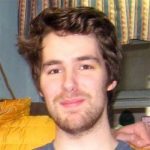 Shane Gannaway is an aspiring writer whose free time is generally composed of reading poetry anthologies, playing pub trivia, and managing a number of fantasy sports teams. Even though his dream of becoming a professional ghostbuster has yet to come true, he remains hopeful; he wants to believe.